Victoria, Mahe (Seychelles) – September 19, 2017 (travelindex.com) – The important UNWTO 22nd General Assembly that just ended in Chengdu, China. 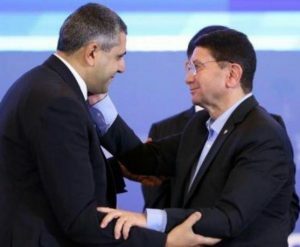 UNWTO has a new Secretary General elect in the name of Zurab Pololikashvili of Georgia. Following his election by the 105th UNWTO Executive Council earlier this year (12th May) in Madrid Spain, the Organisation’s General Assembly has confirmed the election of Mr Pololikashvili. The World of Tourism needs to move ahead and unite behind the new Secretary General of the UNWTO who will be assuming office on the 1st January 2018. The Saint Ange Tourism Report takes this opportunity to wish Zurab Pololikashvili of Georgia success in his new position. The 22nd UNWTO General Assembly in Chengdu was also the opportunity to publicly show the respect and admiration by the world of tourism for Dr Taleb Rifai, the outgoing Secretary General of the Organisation. After his skilful, diplomatic and human style manoeuvring at the confirmation procedures for his replacement, he was given a standing ovation with cheering and clapping. Dr Rifai could not hold back his emotions and shed a tear. Congratulations also to Minister Najib Balala, the Tourism Minister of Kenya who was elected the new Head of CAF (Commission for Africa). Africa has made a good choice. It is always important when electing people to such positions to look at the country to see if they are a benchmark or not for the tourism industry. The Minister of Tourism for Kenya will now lead CAF for the new term ending 2019. The two African Vice Presidents of the 2017 UNWTO General Assembly were Minister Lai Mohammed of Nigeria and Minister Jose da Silva Gonzalves of Cabo Verde. Both did Africa proud. Seychelles has also proudly retained its seat in the UNWTO Executive Council for a further two years. The Minister of Argentina was duly elected Chairman of the Executive Council, and the Ministers of Zambia and India as the two Vice Chairmen. Minister Maurice Loustau-Lalanne accompanied by his PS Anne Lafortune, Seychelles Ambassador to China Vivienne Fock-Tave, Jean Luc Lai-Lam, Seychelles Tourism Board’s Manager for China and Rachel Shen also of the island’s Embassy in China attended the UNWTO General Assembly. We also take this opportunity to officially congratulate Dr. Taleb Rifai, the outgoing Secretary General of the UNWTO for a job well done. His two consecutive terms of office clearly display his successes through his personal drive that was aimed at uniting the world of tourism. We also wish Dr Rifai and Mrs Nisrine Rifai and their family good health and continued happiness. The challenges for the tourism industry will not be getting any easier. The need to regroup to deliver a consolidated tourism industry is today more important than ever. This is why we are reporting today on the Cleverdis Group with their Hotel & Tourism Magazine. Gerard Lefebvre, the President & CEO of the group was also in Chengdu and we had the opportunity to discuss tourism trade fairs and trends coupled with existing opportunities. They are the producers of most of the official publications for the important tourism trade fairs and their opinion matters. Brand Africa was also a topic discussed on the sidelines of the UNWTO General Assembly. Many of the Tourism Ministers or Country Representatives discussed the drive by PMAESA, the (Ports Management Association of Eastern and Southern Africa) and their “Cruise Africa” drive. From North to South, from East to West, African States who feel they have facilities and the potential to receive Cruise Ships or to develop cruising in rivers, waterways and lakes are today ready to move together as one. I was personally able, as a Consultant contracted by PMAESA to open discussions with Congo Brazzaville, Nigeria, DRC, Morocco, Algeria and Cote D’Ivoire to name but a few. All are welcoming the work being done to give a needed push to Cruising in Africa, and this inclusive of the registration of the “Cruise Africa” name that has already been effected. But as Africa looks at it narrative, it is important that Tourism for All is echoed with respect as the principle guiding Africa. President Nelson Mandela of South Africa coined the Rainbow Nation tagline for South Africa showing how proud he was of the diversity that makes South Africa strong. May this vision that goes beyond colour of the skin, of religion, of political affiliation, of gender and of disabilities among others, remain the mission of Africa and its Brand Africa. Africa knows today that its Brand Africa is a necessity. The CAF Body of the UNWTO now under the Chairmanship of Minister Najib Balala, the Tourism Minister of Kenya has the responsibility to move this agenda forward. The time is now to rewrite the narrative for Brand Africa as PMAESA, the (Ports Management Association of Eastern and Southern Africa) and their “Cruise Africa” drive is gathering pace with an appeal for Cruise Ship Ports from all over Africa to be united as one for positioning Africa as a unique cruise ship route. This drive is seen as an example of Africa being invited to work together to grow the cake for Africa. “It is the case of getting the call right and being able to think big” said Alain St.Ange in Chengdu China during his meeting with different Tourism Ministers of the Continent. Minister Siandou Fofana of Cote D’Ivoire wants the cruise ship business and on the sidelines of the UNWTO General Assembly in Chengdu China he also met with Alain St.Ange, the former Seychelles Minister for Tourism, Civil Aviation, Ports and Marine who is now heading his very own Saint Ange Consultancy. The meeting in Chengdu was also assisted by Laetitia Mockey, the Cote D’Ivoire Technical Advisor responsible for Cooperation and Partnerships at the Ministry of Tourism and Isabelle Anoh their Director of Communication. “We need to grow our tourism industry and we want a bigger share of the Europe Tourism Market” the Cote D’Ivoire Tourism Minister said as he discussed with Alain St.Ange for matters relating to visibility, marketing, training, hotel grading and classification, the development cruise ship business and a super yacht marina amongst others. Cote D’Ivoire is known to be the biggest producer of Cacao and is also a big producer of coffee, and peanuts among many other produce. But they also have many unique selling points, which should make them a major tourism destination of the continent of Africa, and they say they are now ready to embark on this journey. “Big Game Fishing is good with Cote D’Ivoire holding records for Marlin” the Minister said as they planned the move to place Cote D’Ivoire firmly on the tourism map of Africa. Alain St.Ange of Saint Ange Consultancy is planning a fact finding visit to Abidjan where further discussions of cooperation will take place. During the UNWTO Assembly in Chengdu, these two industry thought leaders agreed to deepen their longstanding cooperation on Green Growth and Quality, exercised to date in the International Coalition of Tourism Partners (ICTP). Lipman – with leadership spells in IATA, WTTC and UNWTO – is known for his championing of Green Tourism over the past 25 years, with his friend and mentor the late Maurice Strong, the man behind UNEP, the Brundtland Commission, and the 1992 Rio Earth Summit. During the Assembly, Ambassador Dho praised Lipman as the “ST-EP Father” of UNWTO’s flagship poverty reduction program. St. Ange, fresh from his campaign for UNWTO Secretary General, has agreed to serve as vice Chair of SUNx the Strong Universal Network, with a fixation on climate change, a focus on the next generation and a strategic global response network for smart learning, innovation, and resilience. He also agreed to help promote the SUNx concept of Impact-Travel, as a template for good and bad impacts to be measured and managed coherently; with green growth at the core; and 2050 Paris proofed. St.Ange said “I am honoured to be involved as Vice Chair of the SUNx Movement. This Good Impact – Travel for a Cooler Planet mission is a needed one. The world has woken up believing in Sustainable Tourism Development. This is a great move and is appreciated. As Dr Taleb Rifai, the Secretary General of the UNWTO said in Chengdu China during the General Assembly “Sustainability is to Sustain Life” it is our duty now more than ever before to rally forces to save our planet and in so doing sustain Life”. Seychellois Kenneth Racombo has been appointed the acting Chief Executive of the Regional Tourism Organisation of Southern Africa (RETOSA). RETOSA is responsible for the development of tourism and destination marketing across the Southern Africa Member States, in collaboration with both the public and private sector. Aside of Seychelles, the RETOSA-member countries include Angola, Botswana, Democratic Republic of Congo, Lesotho, Madagascar, Malawi, Mozambique, Namibia, South Africa, Swaziland, Tanzania, Zambia and Zimbabwe. Mr Racombo was appointed as the organisation’s executive responsible for resource mobilisation and development in May this year. In his new role as acting CEO, he will be leading the management through a focused process of securing much needed strategic partnerships, funding and an innovative tourism value proposition for the region. Commenting on his appointment, Mr Racombo said he is grateful for the confidence vested in him by RETOSA. He said that although the task ahead is very challenging, he is determined to ensure that the organization works towards achieving its vision of increasing tourist arrivals and tourism receipts within the SADC region, with the support of a strong director for marketing and communications and an experienced director for research and information management. “With the aim of making tourism a key pillar to the economic development of SADC two key priorities for the organisation will be brand promotion and marketing and the involvement of private sector. The organisation will also need to engage in resource mobilization and innovative ways of financing its projects and key activities .There is also the need for the organisation to work very closely with the tourism and investment bureaus of the SADC member states to ensure complementary,” he added. Mr Racombo’s career has been primarily focused on economic diplomacy and regional integration. Before joining RETOSA in May, he was the Director General at the Seychelles’ department of Foreign Affairs, where he also started his career as an economist. He also served as the permanent liaison officer for Seychelles to the Indian Ocean Commission. He holds a degree in economics from the University of Mauritius, a master’s degree in diplomatic studies with the University of Pretoria, and a master’s degree in leadership and strategic management with the Institute of Public Administration in Ireland. With tourism being the mainstay of the Seychelles economy, Mr Racombo’s appointment by RETOSA, although interim, is viewed as an important milestone in Seychelles’ endeavour to be more engaged in tourism development at the multilateral level, and more so in the SADC region. RETOSA, which has been in existence for 20 years, recently embarked on a comprehensive transformation process. This was agreed upon by ministers attending the seventh meeting of SADC ministers responsible for tourism held in Gaborone, Botswana, in July last year. The organisation has also announced its repositioning strategy, which is aimed towards achieving its vision of increasing the SADC region’s share of tourism to 5 percent of global tourist arrivals and receipts within the next decade up from its current share of 2 percent. “Small Island, Small Car, small road, small population but a giant Vision” these are the words being echoed by Mauritius. In Mauritius they say that they have a Huge Mission and that they have formulated a fantastic direction to ownership of land in a beautiful destination. “Welcome to the Island of your dream and fascination! As you sow, so shall you reap, life is not cheap, In Mauritius so shall you leap!” the tag line of some entrepreneurs echo. With a stable political situation, a democratic political system and a peaceful social climate, Mauritius is known as one of the best Taxation Policy Destination in the world. The country offers a favorable environment for investors :- A single rate of income tax @ 15% companies, Double taxation treaty signed with 35 countries, including France, No taxes on capital, No inheritance tax, Dividend tax exempt, Capital gains on the capital and tax-exempt on real estate, Free repatriation of profits, dividends and capital.